After 3.5 months in Asia, we've now moved on to the United Kingdom - land of unintelligible accents, weather that strips the skin off your cheeks, the miracle meat substitute 'quorn', damn good sausage and filled with so many of our family and friends. Feels great to be in such familiar surroundings. 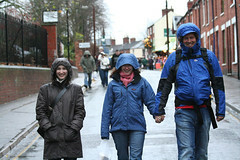 This photo of my sister, me and Phil (who is not in fact pregnant, but protecting camera under his raincoat) was taken by Lucy's partner Dave, who was taking us around his home town of Lincoln. The famous Lincoln Christmas markets were on, but the weather was so revolting we came, we saw, we imbibed mulled wine and sausage, then retreated back to Dave's parents' house PDQ! Sorry about absence of bloggage but it's hard to take photos of cathedrals when freezing rain is blowing horizontally into your face. Hope you are all disgracing yourselves spectacularly at christmas parties.